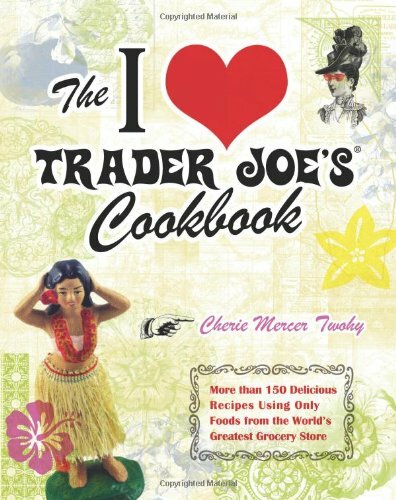 After prowling Renegade Handmade last weekend, I ended up flipping through the I Love Trader Joe’s Cookbook at Urban Outfitters. In case I haven’t mentioned it before, seventeen times probably, I love Trader Joe’s. So does Cherie Mercer Twohy, apparently. There’s an important lesson to learn here: If you’re looking for inspiration, spend time in a place full of things you love. Trader Joe’s is good for browsing, and you won’t believe how many cooking and baking ideas will hit you as you walk the aisles. With or without this book in hand, the store is a great place for inspiration. trader joe’s organic ketchup: I basically put this on everything. It’s absurd. It’s not for everyone, but I love the flavor more than any other organic ketchup. Most notably, I love using this stuff in my favorite meatless meatloaf recipe, by Giada De Laurentiis. I use TJ’s ketchup in place of the checca sauce (too much garlic is not my friend) and it lends a nice smokey flavor. cranberry apple butter: Be still my beating tart heart. I love cranberry; it’s one of my favorite flavors out there. And I don’t like to over-sweeten it; I like it harsh. This apple butter goes on everything I haven’t put ketchup on…I’ve blended it into whole wheat pancake batter, and put it on toast, in oatmeal, even on a chicken sandwich (with cheddar. Seriously–try it.) What I really want to do is find the perfect way to bake with it. I have an apple butter muffin recipe I’d like to try, among other things. But I want to make my own cranberry apple butter, too…heavier on the cranberry. No offense, TJs, but it could pack a little more punch. vino: So, I guess I won’t be getting a job at LA Weekly, nor am I what they apparently consider a grownup. I am fine with both of these things. Any time I can get to TJs when I need wine, I go. It’s perhaps not the most sophisticated or shocking selection, but I’ve never walked away disappointed. That $4 bottle of Hungarian Bull’s Blood will forever live in my liver. And hey, if you’re more interested in exotic, pricier, “grownup” wine, I suggest you still hit the TJs aisle for wine to cook with. What are your favorite buys at TJs?